Aculturally-contrived homosexuality (significantly not termed as such by its practitioners) appears to affect a far greater population base then some researchers would argue is attributable to natural inclination. Some of its root causes lie in the severe segregation of women, the prohibitive cost of marriage within Pashtun tribal codes, and the depressed economic situation into which young Pashtun men are placed. Other root causes include a long-standing cultural tradition in which boys are appreciated for physical beauty and apprenticed to older men for their sexual initiation. The fallout of this pattern of behavior over generations has a profound impact on Pashtun society and culture. 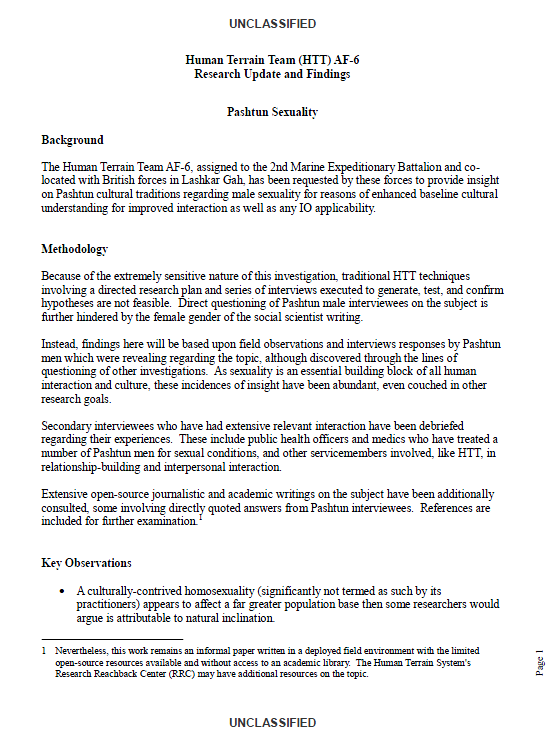 Homosexuality is strictly prohibited in Islam, but cultural interpretations of Islamic teaching prevalent in Pashtun areas of southern Afghanistan tacitly condone it in comparison to heterosexual relationships in several contexts. Pashtun men are freer with companionship, affection, emotional and artistic expression, and the trust bred of familiarity with other men. They often lack the experience of these aspects of life with women. This usurping of the female role may contribute to the alienation of women over generations, and their eventual relegation to extreme segregation and abuse. greater population base then some researchers would argue is attributable to natural inclination.